When I was first getting serious about my photography, I remember being told how important it was to isolate my subject in order to prompt the viewer to focus on what I thought was important. At this time of the year I take a lot of photos of insects and it is often a real challenge to isolate them from their backgrounds. As I was going through some images from this past weekend, I noted that I tried a couple of different approaches when photographing male Widow Skimmer dragonflies (Libellula luctuosa) at Jackson Miles Abbott Wetlands Refuge. In one case, I tried to isolate the dragonfly by shooting at an upwards angle, thereby eliminating the clutter of the vegetation. 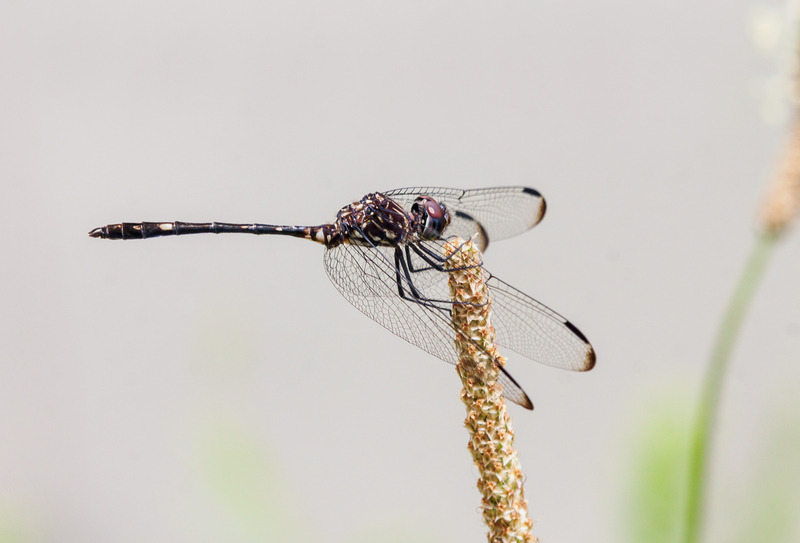 Of course, it helped that the dragonfly cooperated by perching at the tip of the stem. 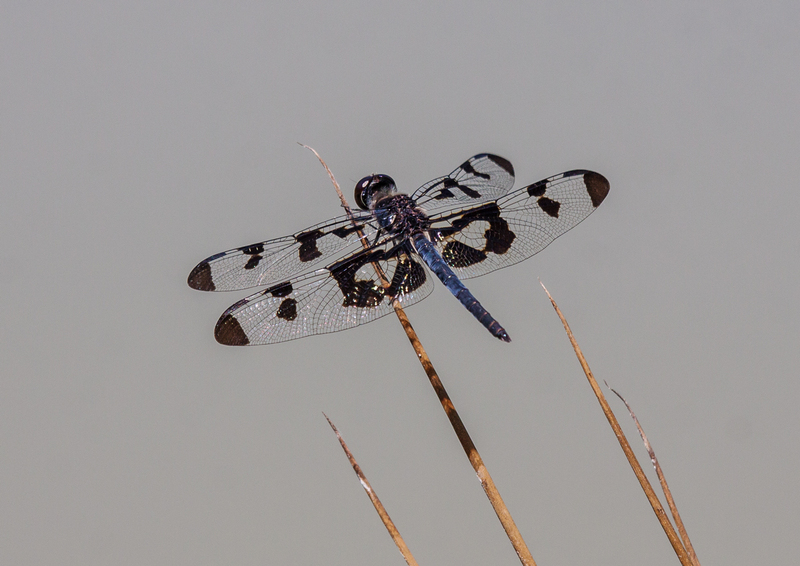 I really like the way that the colors and shapes of the background almost match those of the dragonfly. In a second case, the dragonfly was perched in the midst of the vegetation. I moved to a position so that my camera’s sensor was on a parallel plane to the dragonfly’s open wings and opened the aperture pretty wide. Normally I try to keep the aperture stopped down in an effort to get more parts of the dragonfly in focus. 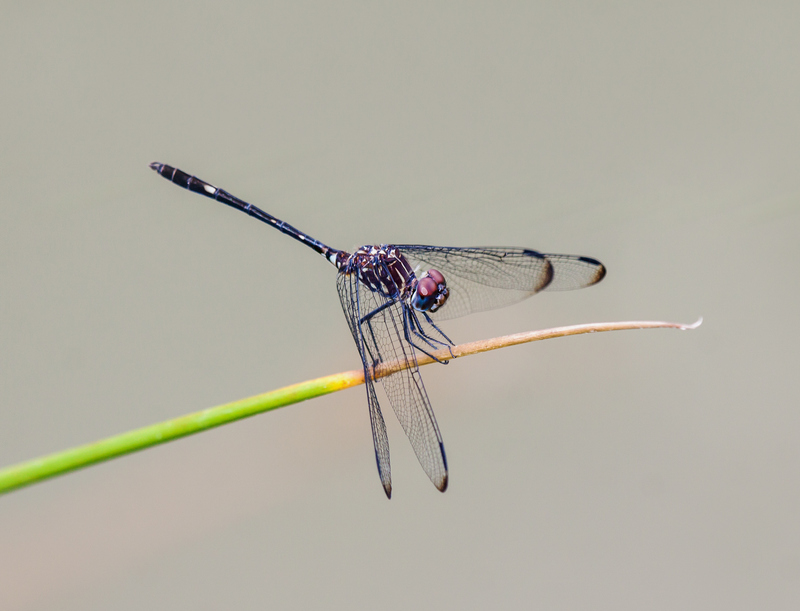 This time, however, the dragonfly was relatively flat and I was able to throw the background a bit out of focus without losing the details of the dragonfly. 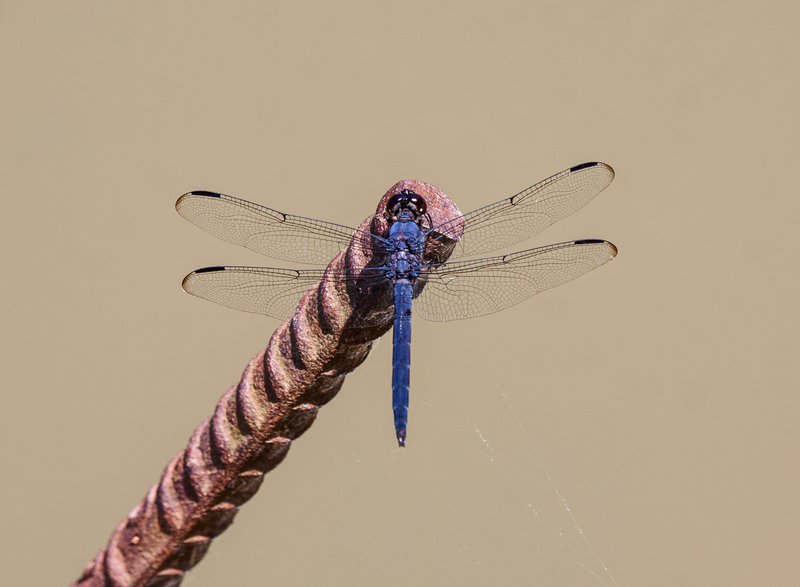 The contrast of the background colors with those of the dragonfly helps it to stand out, while retaining a sense of the environmental setting. There are lots of other ways to isolate subjects. Sometimes we have the luxury of being able to think about them, but often we are forced to make rapid decisions about shooting angles and camera settings that will have a huge impact on our final images. Summer is definitely here. In the Washington D.C. area where I live, summer means endless stretches of hot, humid weather. Even the insects seem to move more slowly, like this Eastern Amberwing dragonfly (Perithemis tenera) that I recently photographed as it languidly buzzed around the vegetation at Brookside Gardens in Wheaton, Maryland. 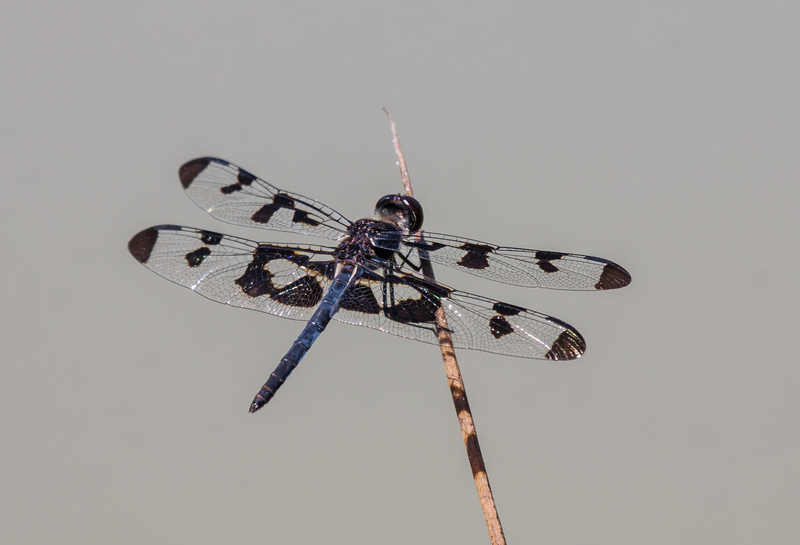 I love the juxtaposition of natural and man-made elements in this shot of a Slaty Skimmer dragonfly (Libellula incesta) perched recently on a piece of rebar sticking out of the water at Mulligan Pond at Jackson Miles Abbott Wetlands Refuge. The colors and shape enhance the visual contrast between the two primary elements in this very graphic and simple composition. Photography doesn’t always have to be complicated to be effective—I need that reminder from time to time. How much of the environment do you show when your primary subject is a bird? Normally I try to fill as much of the frame as possible with the bird through a combination of zooming and cropping. Yesterday as I walking along Cameron Run, a suburban waterway that feeds into the Potomac River, I spooked a Great Blue Heron when I took a few steps in its direction. A smaller bird was also spooked and it flew to a rock in the middle of the stream. I was thrilled when I realized that it was a Black-crowned Night Heron (Nycticorax nycticorax), a bird species that I don’t see very often. It would have been easier to get a shot if I had been carrying my long zoom lens, but instead I had my 180mm macro lens on my camera. Fearful that the bird would take flight again, I took some initial shots and then slowly moved forward. As I climbed over large rocks toward the water’s edge, I’d stop and take a few more shots. 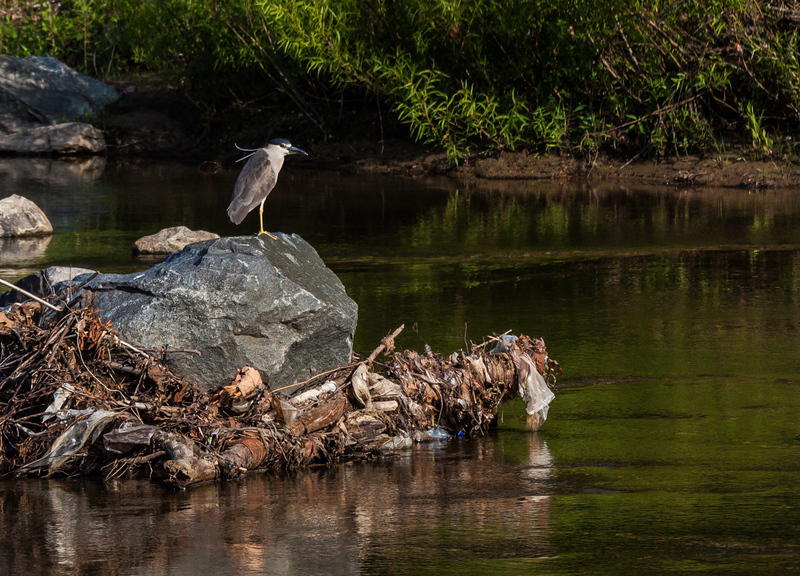 After I reached the water, I decided to change lenses and put on the 70-300mm lens that was in my camera bag and, of course, the night heron flew off as I was changing lenses. When I was at the closest point, I was able to capture an image that, with a lot of cropping, shows some of the beautiful details of the heron, including its startlingly red eyes, but as I looked over my images, that was not my favorite one. My eyes kept returning to the landscape shot. 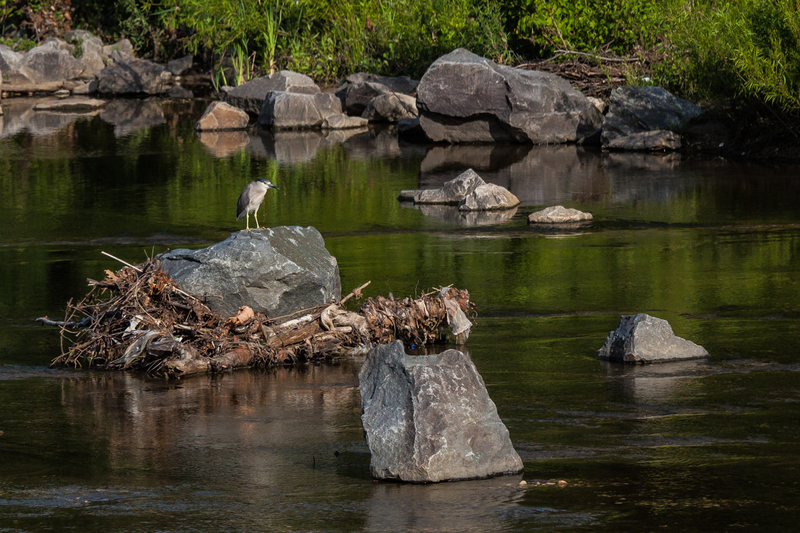 in which the heron is only one element of a beautiful composition of rocks and water. What do you think? 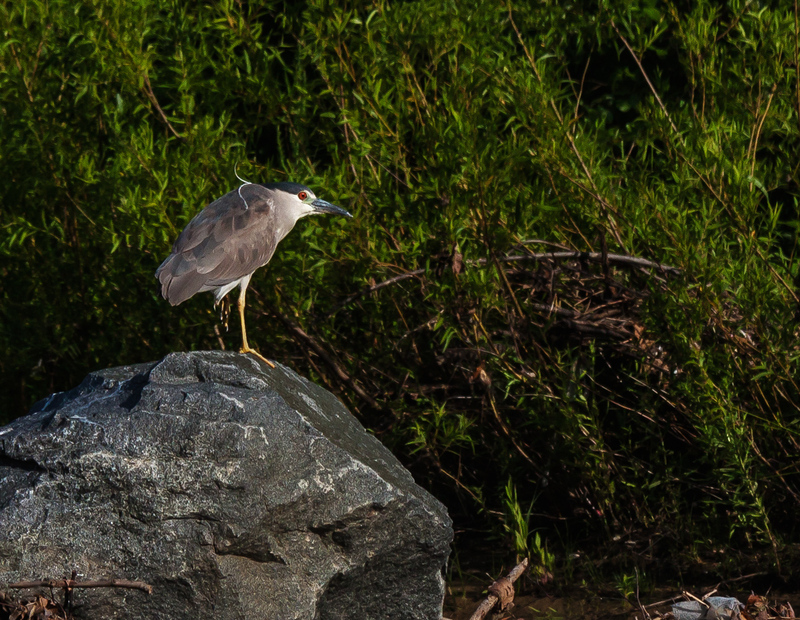 I’m posting three different shots of the night heron with varying amounts of background context, so you can see how the scene changed as I zoomed with my feet (and cropped in post processing). Yesterday I spotted my first Banded Pennant dragonfly (Celithemis fasciata) of the season at Jackson Miles Abbott Wetlands Refuge at Fort Belvoir, Virginia. I love the beautiful blue color of its body and its boldly patterned wings. The males of this species seem to like to show off a bit by perching on the very tip of vegetation, which is both a blessing and a curse. 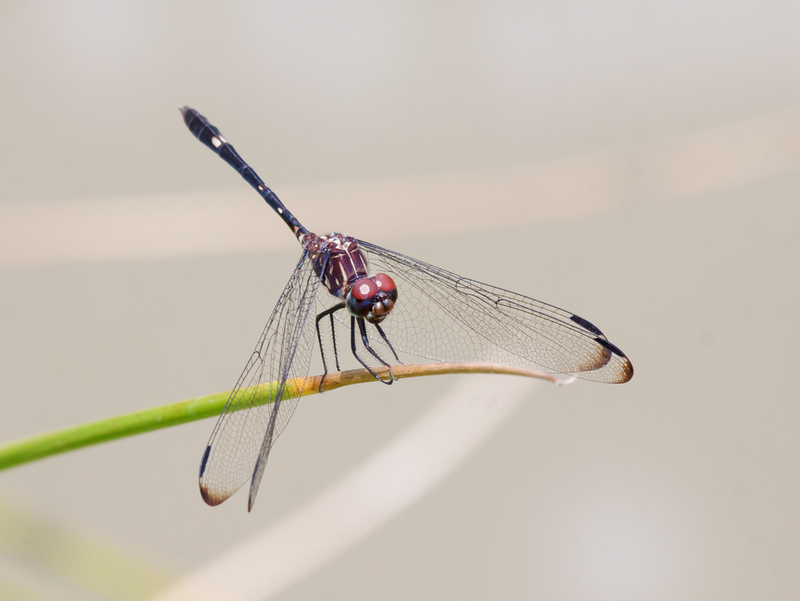 It is a blessing because the dragonflies are easier to spot than those that perch low in the vegetation. It is a curse, however, because the slightest breeze causes the dragonflies to oscillate madly, making it tougher to get sharp shots of them. Yesterday I spotted a very cool-looking, but unfamiliar dragonfly. 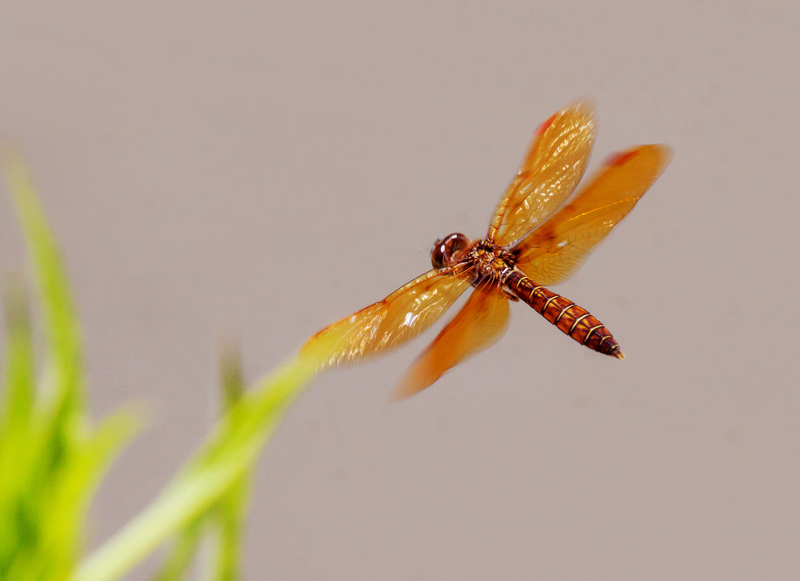 I ended up posting an image in several Facebook groups in an effort to get an identification from some of the experts and was a little shocked to learn that it is a male Swift Setwing dragonfly (Dythemis velox), a primarily southern species that may never before have been spotted in Fairfax County, the county where I live. It looks like this species is spreading northward. 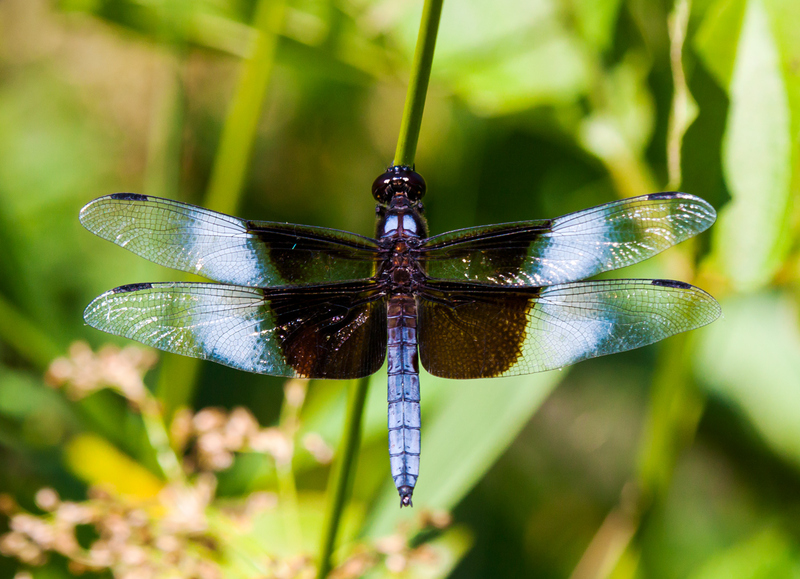 According to a posting on an Ohio natural history blog, this dragonfly species was spotted for the first time in Ohio in 2014 and a photo was posted today of a teneral female Swift Setwing in Champaign County, Ohio. 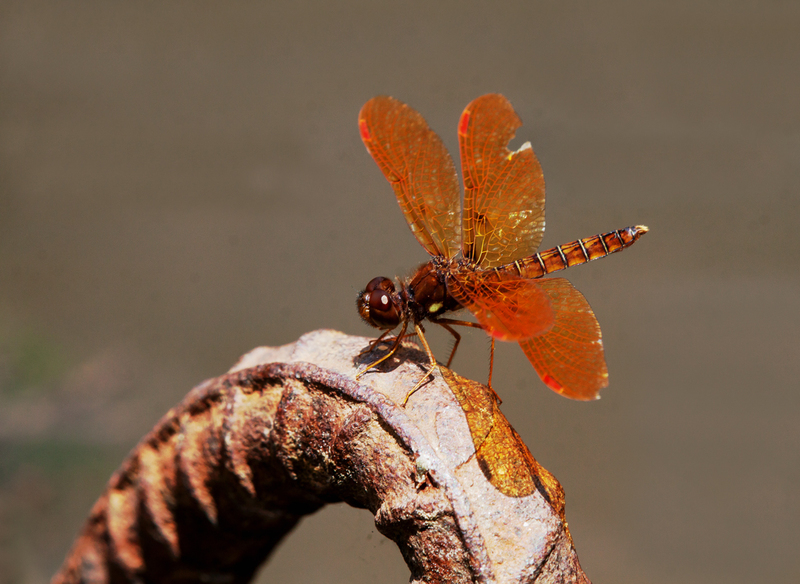 Normally I like to photograph dragonflies in their natural environment, but when an Eastern Amberwing dragonfly (Perithemis tenera) chose to perch on a curved piece of rebar recently, the juxtaposition of the natural and man-made elements seemed to create a sense of harmony rather than one of dissonance. I took this photo at a small man-made pond at Green Spring Gardens in Alexandria, Virginia. 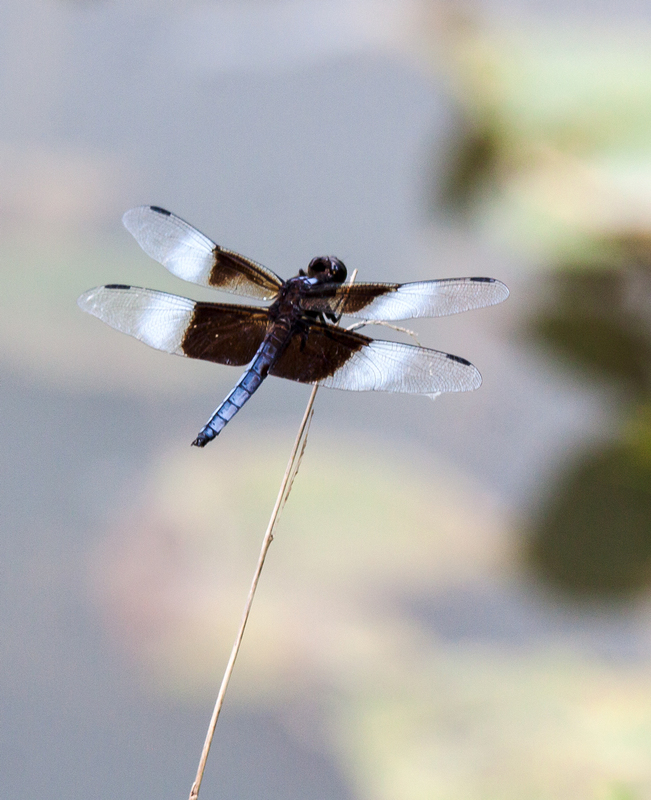 Later in the summer I hope to see water lilies and lotus blossoms at the pond, but it is mostly devoid of vegetation right now, which many be why the dragonfly chose this unusual perch. I have no idea why this piece of reinforcing steel is sticking out of the water, but its reddish-brown color and curved shape made it a good match for this tiny dragonfly.